The RANDARRAY function returns an array of random numbers. You can specify the number of rows and columns to fill, minimum and maximum values, and whether to return whole numbers or decimal values. In the following examples, we created an array that's 5 rows tall by 3 columns wide. The first returns a random set of values between 0 and 1, which is RANDARRAY's default behavior. The next returns a series of random decimal values between 1 and 100. Finally, the third example returns a series of random whole numbers between 1 and 100. Note: January 14, 2019: The RANDARRAY function is one of several beta features, and currently only available to a portion of Office Insiders at this time. We'll continue to optimize these features over the next several months. When they're ready, we'll release them to all Office Insiders, and Office 365 subscribers. You can download a workbook with RANDARRAY function examples if you want to see it in action. FALSE for a decimal number. If you don't input a row or column argument, RANDARRAY will return a single value between 0 and 1. If you don't input a minimum or maximum value argument, RANDARRAY will default to 0 and 1 respectively. The minimum number argument must be less than the maximum number, otherwise RANDARRAY will return a #VALUE! error. If you don't input a whole_number argument, RANDARRY will default to FALSE, or decimal value. The RANDARRAY function will return an array, which will spill if it's the final result of a formula. 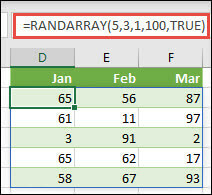 This means that Excel will dynamically create the appropriate sized array range when you press ENTER. 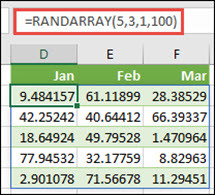 If your supporting data is in an Excel table, then the array will automatically resize as you add or remove data from your array range if you're using structured references. For more details, see this article on spilled array behavior. RANDARRAY is different from the RANDfunction in that RAND does not return an array, so RAND would need to be copied to the entire range. An array can be thought of as a row of values, a column of values, or a combination of rows and columns of values. In the example above, the array for our RANDARRAY formula is range D2:F6,or 5 rows by 3 columns. Download a workbook with RANDARRAY function examples.